"Lux Radio: Ride the Pink Horse"
The Hardboiled Detective Genre is an interesting art form. 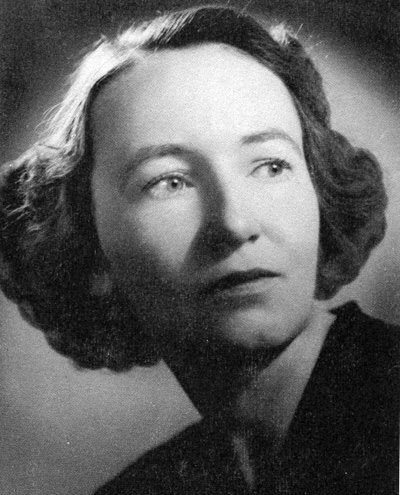 Dorothy B. Hughes was actually a pretty typical practitioner of the art, in that the she was personally far removed from the world she wrote about, a world of psychotic criminals, twisting and tightly written plots, and the evil that lives in the hearts of even the best men. Ms. Hughes was born in Kansas City, Missouri, in 1904. She earned a journalism degree from the University of Missouri in 1924 and moved to New Mexico. The American Southwest, especially Santa Fe and the surrounding towns are the settings of many of Dorothy's stories, including Ride the Pink Horse, a tale of blackmail and revenge set at a small town fiesta. Her stories were greatly appreciated for their atmospheres of fear and suspense. Although the Whodunit and Hardboiled crime was Dorothy's medium, crime was never her primary interest, she wanted to investigate the nature of evil itself. In The Cross Eyed Bear, her heroine tries to save a young man from his father's evil legacy, one which ensures that one of the brother's will murder the other two. What the listener doesn't know is that the heroine herself is caught up in the old man's plot. Ms. Hughes took a break from writing in 1952 to care for her family, but returned in 1963 with her last work of fiction, The Expendable Man. She is also noted for writing a history of the University of New Mexico and a critical biography of Earle Stanley Gardner. Be the first to comment on "Dorothy Hughes"